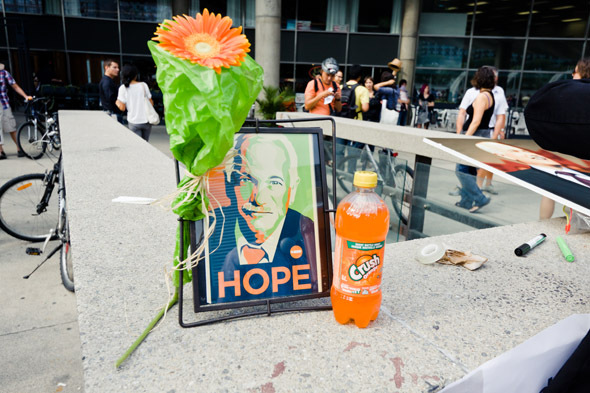 At a quiet corner outside City Hall, hundreds of Torontonians gathered Monday afternoon in an impromptu memorial rally for Jack Layton. Hand-made signs and flags conveyed messages of hope and grief as the crowd stood quietly to honour the man who gave so much to their country and to their city. 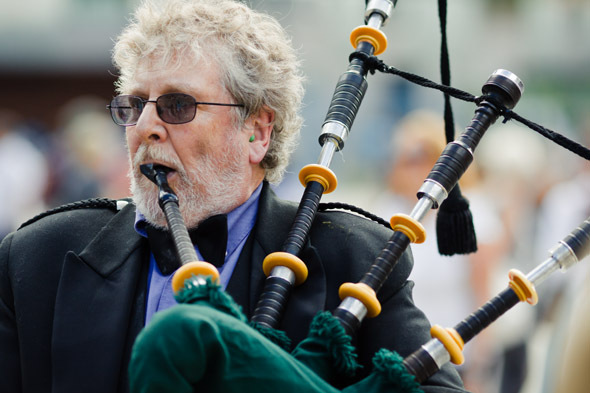 "Jack came from a powerful political family in Canada, and he used that advantage to listen to and give voice to so many who were not powerful," Councillor Pam McConnell told the crowd. "He truly had respect for everyone, and it's clear today that he had friends everywhere." 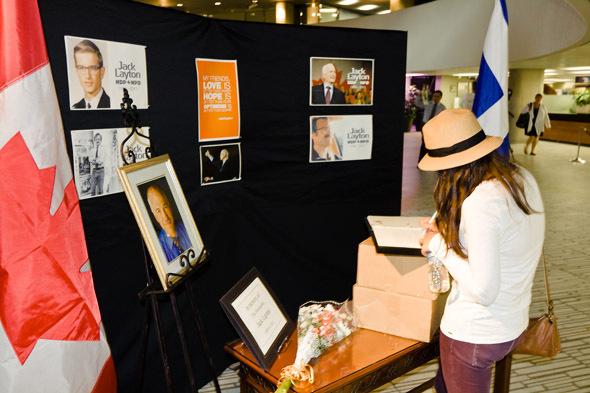 Toronto Councillor Janet Davis and MPP Peter Tabuns took turns tearfully reading excerpts from Layton's final letter to Canadians dated August 20th. "My friends," Layton wrote, "Love is better than anger. Hope is better than fear. Optimism is better than despair. 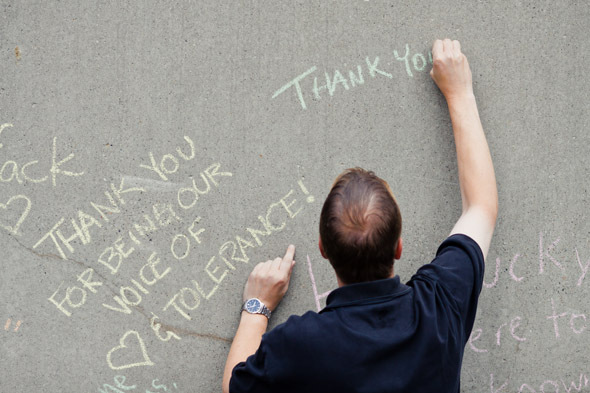 So let us be loving, hopeful, and optimistic. And we'll change the world." A moment of silence followed the reading as the crowd exchanged stories about the late politician. 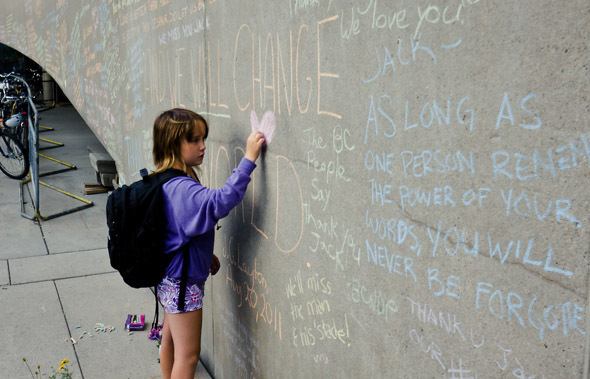 "Jack Layton moved all of us, and we'll miss him a lot," Tabuns told me. 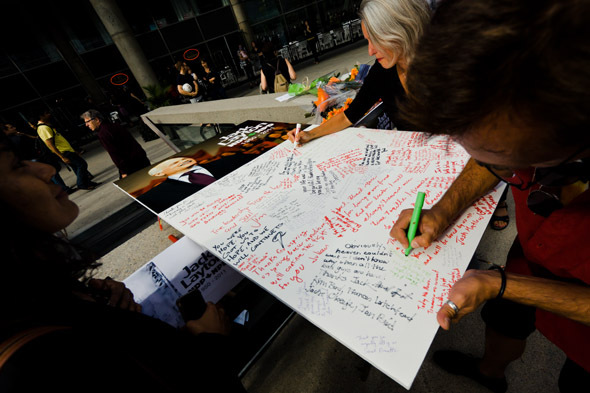 The impromptu memorial was organized this morning through Twitter and Facebook by five young members of the Ontario NDP. "We were sitting around crying, and we figured we were not the only ones," said event organizer Loveleen. "We knew there would be a memorial in Ottawa, but we wanted to do something in Toronto, one of Jack's greatest battlefields." 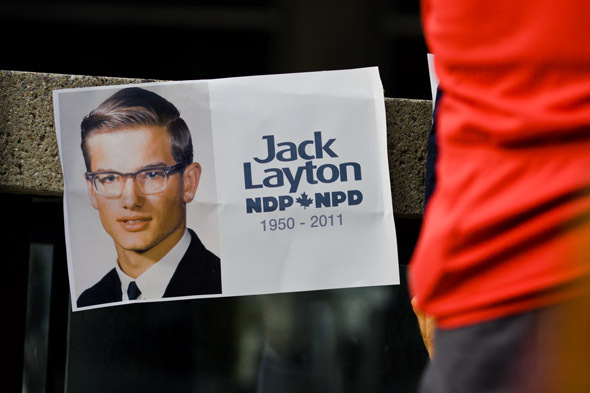 Before becoming the Official Leader of the Opposition, Layton spent 18 years serving on Toronto's City Council and Metro Council. 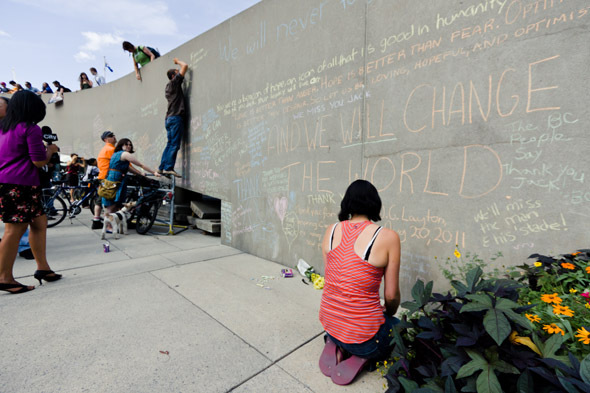 "Jack Layton was more than just a politician - he was a giant," said Shamini Selvaratnam, who co-planned the memorial. "I first met him as a student at York, and he was the most real person you could ever hope for in a leader. So we're here because we loved Jack, and we needed an outlet for our grief." 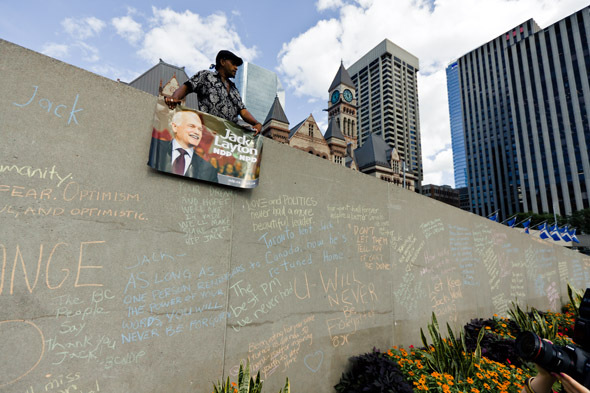 Hundreds lined up to sign a condolence board and book as the walls of Nathan Phillips Square were adorned with chalk messages commemorating the late Leader of the Opposition. In a true tribute to Jack's vision, there was no orange, red, or blue. 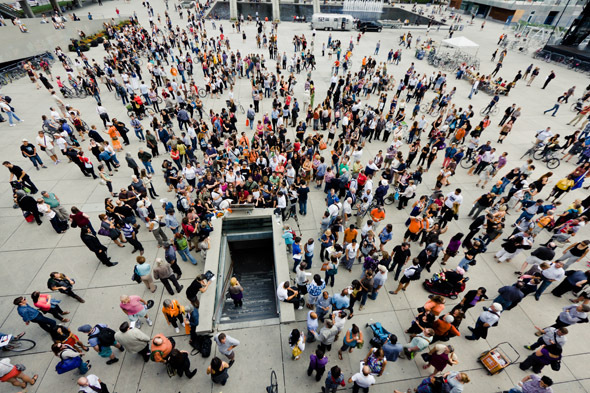 There was red, and there was white, and for one brief moment, united Canadians gathered for an event they hoped they'd never attend. Writing by Riva Gold. Photos by Tom Ryaboi.